While I thought that I grasped just how unique and amazing the Targa Newfoundland is in the world of motorsports, the breadth of this event's character didn't hit home until I got here. We spent the majority of yesterday's morning and afternoon tackling stages in and around Gander, a small town about 206 miles north of St. John's. Despite my completely misinterpreting the route book on stage one and a near miss with an time control, we managed to zero every stage and avoid any penalties, but the two final stages of the day presented a challenge that we weren't exactly prepared for. 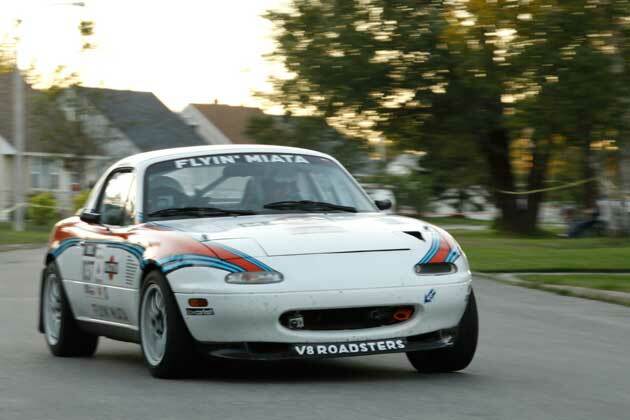 Though the stages we had covered so far had given me gracious periods of three, four and even five kilometers during which I could insert my own time and distance way points to keep the 2006 Flyin' Miata Mazda MX-5 on course and on time, the last two did not. Both stages took place on the same seven kilometer course that wound through a dense subdivision. That's right, kids. We would be attempting to carry a 57.5 kph (35.7 mph) average through a series of 29 90-degree turns. I would have no more than 300 meters at most to alert Brandon Fitch, my valiant driver, of the direction of and distance to the next turn as well as monitor our time as we passed each instruction. I'll be honest; I didn't have much hope for our chances. We lined up, the lights went hot and in a second, we were blurring through the subdivision. With Fitch's help, I was able to glean enough time to glance at our egg timers and equate the figures with our actual distance. We were going to nail it. We zeroed Gander on the first run and managed a repeat performance for the second pass. As Fitch put it, "This is the most awesome thing. Ever. In the history of the world." I'm inclined to agree. Our efforts today managed to place us in first for the second day in a row, but with days of 12-hour driving and calculating quickly stacking up, our chances for careless errors are increasing drastically. Stay tuned for more updates and keep an eye on the 2011 Targa Newfoundland site for our times.